You aren't making money with your cell phone?! I've been making money with cell phones for nearly 3 years and will teach you everything I know. There are over 5 billion cell phone users worldwide since 2010 and this number is growing. The iPhone 4 sells in stores for $199 and $500+ on eBay - can you answer why? Businesses are popping up everywhere advertising to buy your old, seemingly obsolete cell phones. There's a huge unsaturated market that you're unaware of - and it's right under your nose! You're So Close To Making Money With Cell Phones. Can You Smell It? 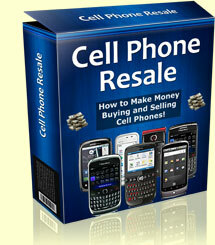 Cell Phone Resale 50 Page e-Book! * A 50-page e-Book laying down the foundation on how to make money buying and selling cell phones!This e-Book is something you cannot miss. Years of experience laid on to 50-pages. Everything from A to Z on how to start making money with cell phones. All within an unsaturated market involving no start-up costs, storefront, or previous knowledge… just your willingness to learn. Topics include where to buy cell phones, where to sell them, how to maximize profits, the benefits of networking and trading, tips & tricks of the trade, and so much more. Cell Phone Resale 10-Video Series! * 10, 7-10 minute videos further explaining and going far in depth about the topics discussed in the e-Book!Text can only explain so much. That's why I created a video series to go deep in to how to maximize your sales, where and how to find the best cell phone deals, the optimal sources to sell cell phones, and so much more. My ranting for two hours explaining exactly how to conquer this entrepreneurial business. The videos are broken up in to 7-10 minute segments so you don't have to watch it all at the same time, but as everything is tied together, I would suggest taking full advantage of the entire series. Cell Phone Resale 60-Day Customer Support! * I'm here to mentor you through email answering any questions you have to get you off the ground!You have all the knowledge you need to start through my e-Book and videos; however, you may still have questions. What should I pay if this is broken? Does this seem fishy? Is this a good buy? What are my possibilities for this transaction? Should I go through with this trade? I'm here to help. I promise a response within 36 hours, though you'll find most responses near immediately, and you'll find out my responses are very in-depth and extremely helpful. I've spent over 2 years in this business learning what works and what doesn't. Now I'm here to tell you everything I know with this package. First time in the site's History we've ever run a Special on the Price! Don't Take My Word For It! Here, Take A Look For Yourself! Over two years ago my business partner and I started buying and selling cell phones to make some money on the side. This screenshot is from eBay around when we started in 2009. Also note this was a single day of feedback. We bought the two iPhone 3GS' for $350 and $380. We sold them for $480 and $490. The Blackberry Tour was bought for $160. We got $248. The 3G we paid $180 for and got $286 in return. As time started moving, so did our sales and revenue. Our purchase costs became lower, our quantity became higher, and keep in mind we had no start-up costs, no storefront, nothing! Just time - around 30 minutes a day put towards searching through local means such as Craigslist and social networks to see what the best deals were, and then we'd act fast and scoop them all up. Starting this venture in college as self proclaimed college entrepreneurs made it especially great for us as there were tons of students and thus, of course, tons of people upgrading, breaking their phones, and so on. We only accepted PayPal payments when selling the phone on eBay (the PayPal amounts as shown in the picture are slightly higher as the buyer had to pay for shipping). Of course, there are other routes than eBay for selling purposes, but eBay was one we relied heavily on as it would always bring top dollar. While I have no excuse for his spelling in the feedback, we did pay $160 for this iPhone 3GS... and we did sell for $255. The entire time spent for this transaction was less than 30 minutes and nearly $100 was made. Is the entrepreneurial light bulb flickering next to your head yet? We paid $250 for this MyTouch 4G which sold for $405. With another almost-30 minutes down the the drain, around $150 fell into our pockets. Talk about a return on investment - I know you're starting to see that this may be a way to boost your income! $60 for this a Droid Incredible with a cracked screen. As shown, the selling price was $182.50. See, people don't know what their phones are worth! That's what we're here to teach willing entrepreneurs that want to start taking advantage of this knowledge. It's so easy once you know what you're doing, and we're here to teach you everything you need to know. Paid $200 for an Evo Shift 4G which sold for $370.25. These were not our best deals, in fact, they were very average and far from some of our best. Further, these were just a small handful - over the past almost-three years we've conducted many hundreds of sales. All of this in total with around 30 minutes a day, no start-up costs, no storefront, no tricks or previous knowledge. All you need is a little entrepreneurial drive and desire to make money..
Order Cell Phone Resale Now! Cell Phone Resale will teach you exactly how to make lots of money by selling cell phones - in the comfort of your own Home! Cell Phone Resale is in digital format (PDF and Videos) which means there is no need to wait for it to arrive. You'll be able to get started in just minutes from now. Questions? "Click Here to Contact Us"
eBay, or Apple, nor have they been reviewed tested or certified by Craigslist, eBay, or Apple.